Davies: "Assen has been good to me in the past"
The BMW Motorrad GoldBet SBK Team heads to Assen for the third round of the World Superbike season and Aragon winner Chaz Davies is feeling confident ahead of the return to the legendary track. Davies now sits in second position in the world championship standings following a double win in Aragon in spectacular style. The Welshman pulled a lead of over 5 seconds in both races at the Spanish circuit, and hopes to continue this fast pace after a tough start to the season in Australia. Davies revealed “After my double win at Aragón I am really looking forward to Assen. Obviously it is a confidence booster every time you win, but doing it twice really sets you up for the next races. I am very comfortable now with the RR and how I am feeling on the bike. On top of that, Assen is a circuit I enjoy and one that has been good for me in the past. Back in 2011, I celebrated my first World Championship victory there by winning the Supersport race, last year it was the first time for me to go through to Superpole 3 and I had a pretty decent pace in the dry. 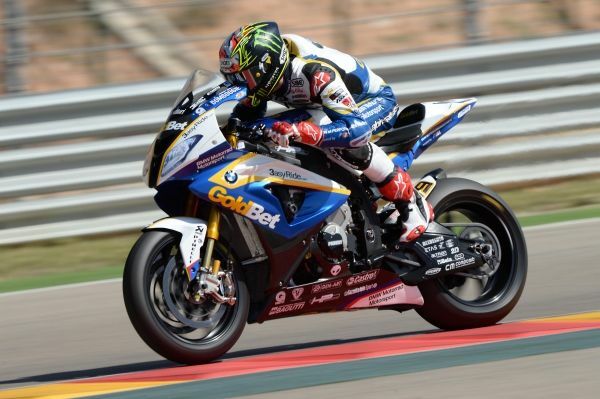 Italian teammate Marco Melandri had a consistent weekend in Aragon two weekends ago, he finished both races in the top five. Still recovering from shoulder surgery he underwent after race one in Philip Island back in February, Melandri is taking it one race at a time and began to struggle towards the end of race two in Aragon two weeks ago. The 30 year old has finished inside the top five in the three races of 2013 that he has finished, and hopes to continue this run. Melandri said “My shoulder was feeling ok in Aragón for most of the weekend. Only towards the end of race two did I start struggling. The shoulder was a bit inflamed so to compensate I stressed the other arm more and as a result I got some cramps. Anyhow, I am quite calm because I have enough time until the next race to cure the inflammation. In the meantime I am continuing with physiotherapy and training in order to be fit in Assen. Assen is a nice track and I feel really comfortable there, even if I prefer the old layout which was wider. What really concerns me is the weather. Last year we weren’t lucky with it, so I hope this time it will be good and not too cold. The best thing in World Superbikes is the fact that balances are constantly changing. In Australia, it seemed that Aprilia was unbeatable. Then in Aragón, it changed. For Assen I expect an open race, with Aprilia, Kawasaki and Chaz being very fast. I feel better and I am improving my feeling with the bike. I am quite optimistic that we will not have the same issues as in Aragón.